Four years after introducing iGoogle mobile, Google has officially discontinued the mobile version of iGoogle. As many of you know, Google will be discontinuing iGoogle completely in 2013 and users are not happy. iGoogle mobile was officially dropped on July 31st but I think it didn't stop working until a few days ago and that is when users began complaining. A Google Web Search Help thread has complaints that although the mobile version doesn't work, you should be able to access the desktop version from your mobile device. 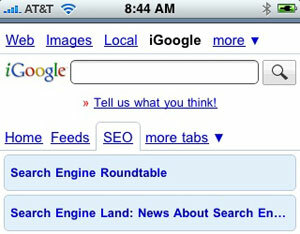 Right now, it redirects you to the Google search mobile home page and gives you no way to access iGoogle. Again, iGoogle desktop is shutting down November 1, 2013.